Edward Jacobson (1891-1955) was born in New York City to Jewish-Lithuanian immigrants. The family was extremely poor, and soon set out for new opportunities in the Midwest. As a teenager, Jacobson worked in a Kansas City factory and became good friends with one Harry Truman. The two eventually parted ways, with Truman enlisting in the National Guard and Jacobson working as a salesman. Years later, at the outbreak of World War I, Jacobson enlisted in the army and happened to be placed in the 129th Field Artillery – where Truman was first lieutenant. Over the course of the war, Truman and Jacobson ran a unit canteen (where soldiers can buy goods), starting it off by collecting $2 from their fellow soldiers to get their initial stock. While most canteens inevitably lose money, Truman’s and Jacobson’s canteen actually turned a huge profit. They were able to return the $2 to all the soldiers, and eventually raised $10,000 in profits. After the war, they used some of this money to try their hand at a number of business (including the Truman & Jacobson Haberdashery), all of which ultimately failed. 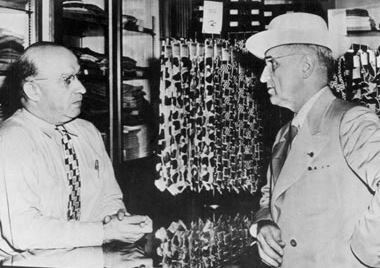 Truman would go into politics, while Jacobson remained a travelling salesman. Whenever he happened to be in Washington, Jacobson would make sure to visit his old friend. In 1945, Jacobson founded Westport Menswear in Kansas City and finally found success in business. Meanwhile, in 1944, President Roosevelt was running to be re-elected for an unprecedented fourth term. He realized that to win he would have to replace his increasingly unpopular vice president, and the party eventually settled on the likeable and devout Truman. The duo won the election, and were sworn in on January 20, 1945. However, Roosevelt was in failing health, and would often get severe headaches or suddenly fall unconscious. Just 82 days later, he died of a cerebral hemorrhage, leaving Truman with the presidency. Throughout this time, Jacobson and Truman retained their strong friendship, and some report that Jacobson had open access to the Oval Office. In early 1948, the Zionists were campaigning for support of their hopeful state. While Truman sympathized with the Jews, the US State Department was vehemently opposed to the creation of a Jewish state. So many Jews were petitioning Truman that he refused to hear any more of it. When Chaim Weizmann made a last-ditch effort trip to the US, Truman wouldn’t meet him. It was then that Jacobson, though reluctant and afraid to damage his lifelong friendship with Truman, approached him and said: “Your hero is Andrew Jackson. I have a hero too. He’s the greatest Jew alive. I’m talking about Chaim Weizmann. He’s an old man and very sick, and he has traveled thousands of miles to see you.” Truman relented, and Weizmann managed to convince him to support a Jewish state. While the State Department warned Truman that he would risk losing the support of Arabs, and more importantly, their oil supply, Truman replied that he would decide “on the basis of justice, not oil.” Less than two months later, Ben-Gurion declared independence, and Truman was the first to recognize the State of Israel just 11 minutes later. When Truman left the presidency, he intended to take a trip to the Holy Land, and Jacobson was planning to be his guide. Unfortunately, Jacobson died of a sudden heart attack before it could happen. The Truman Library maintains a huge collection of documents and correspondence between Jacobson and Truman (available here), and there is now a play, called ‘Eddie’, based on their warm relationship. Hitler had been murdering Jews right and left. I saw it, and I dream about it even to this day. The Jews needed some place where they could go. It is my attitude that the American government couldn’t stand idly by while the victims of Hitler’s madness are not allowed to build new lives. This entry was posted in Business & Finance, Extraordinary Individuals and tagged Ben Gurion, Chaim Weizmann, Declaration of Independence, Harry Truman, Israel, Kansas City, Lithuanian Jews, Roosevelt, Truman Library, World War I, Yom Ha'Atzmaut on April 19, 2018 by Jew of the Week. As a child, André Citroën was inspired by the Eiffel Tower. He lived to see his name displayed on it. This early “billboard” marketing technique is still a Guinness World Record for largest advertising sign. André-Gustave Citroën (1878-1935) was born in Paris to a Dutch-Jewish father and Polish-Jewish mother. 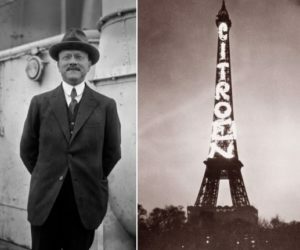 The last name “Citroën” comes from his grandfather, who sold fruit for a living in the Netherlands and was known as Limoenman, so his son made the family last name Citroen, which means “lemon”. As a child, Citroën was inspired by the Eiffel Tower and by the works of Jules Verne and dreamed of becoming an engineer. After graduating with an engineering degree, Citroën went on a trip to Poland to see his mother’s birthplace. There, he saw a carpenter working with a gear that had a “fish bone” structure. Citroën realized that such gears could be used in automobiles to make them quieter and more efficient. He bought the patent from the carpenter, then tweaked the designs until he came up with the automotive double helical gear. The Mors auto company successfully integrated these gears to make better cars, and by 1906 Citroën was the company’s director. With the outbreak of World War I, factories were being converted to produce weapons, and Citroën soon became world-renowned for increasing factory productivity. He took charge of fellow car-maker Renault’s large plant, now having its 35,000 employees making armaments. Citroën’s work played a key role in ensuring the Allies were well-armed and helping them win the war. Following the war, Citroën founded his own Citroën automobile company in 1919. Within just a dozen years, it became the world’s fourth largest car manufacturer. The company was most famous for its executive Traction Avant model, which pioneered a number of revolutionary features including independent suspensions on all four wheels and front-wheel drive. Investing so much money into research and development ultimately drove the company to bankruptcy and it was bought out by its tire maker Michelin. Citroën died the following year from cancer. He was buried in Paris’ famous Montparnasse Cemetery, with a traditional Jewish ceremony presided by Paris’ chief rabbi. A number of streets and parks in the city are named after him, and in 1998 Citroën was inducted into the Automotive Hall of Fame. Meanwhile, his company retained his original vision, and continued to pioneer many new technologies (like modern disc brakes, self-leveling suspensions, and swiveling headlights), becoming one of the most iconic car brands in the world. If someone says,“I have worked hard, and I have not been successful,” don’t believe him. If someone says,“I have not worked hard and I have been successful,” don’t believe him. If someone says,“I have worked hard and I have been successful,” believe him! The double helical gear inspired the Citroën logo. This entry was posted in Business & Finance, Science & Technology and tagged Automobiles, Automotive Hall of Fame, Automotive Technology, Car, Citroen, Double Helical Gear, Dutch Jews, Eiffel Tower, French Jews, Guinness World Records, Montparnasse Cemetery, Mors, Paris, Polish Jews, Renault, Traction Avant, World War I on February 21, 2018 by Jew of the Week.